Raise crops and animals together! 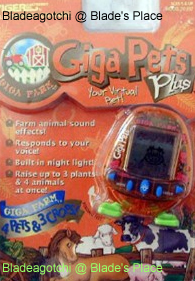 The Giga Farm truly is a unique virtual pet for two reasons. Firstly, instead of looking after one animal at one time, you can have up to four. The second is that you can (and must) raise crops, which the animals rely on for food. You're basically looking after a farm. You have four fields (pastures) to use. You can leave a field empty - 'fallow'. You can raise a cow, a pig, a sheep and a horse, and you can grow beans, corn and wheat. Your animals eat the crops you grow, and in turn, you fertilize the crops with the waste from your animals. It's your decision what to raise, but you must grow Corn for your animals, and you start off with only being able to raise one animal. The pig eats corn or wheat; the cow eats grass (always available) or corn; the horse eats corn or wheat; and the sheep eats grass or corn. However, when you start the unit, the sheep isn't available until you unlock it (enter "BAARAMEWE" on the name screen); and the cow isn't available either until you unlock it (you need to enter "MILKY WHITE" on the name screen, or grow 100 of each seed). I've found that crops take about ten hours to grow. It's best to plant them early in the morning - between 5am and 7am; and then havest them in the afternoon between 3pm and 5pm. If you harvest them too early, or too late, they turn into compost! 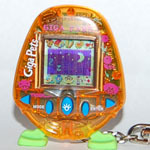 I have instructions for this virtual pet on my Giga Pets Instructions page. If you're seeking one now, the best bet now is to try eBay. Good luck!